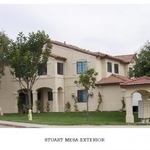 The Stuart Mesa Community is located on base, within 5 miles from the front gate to Camp Pendleton and I-5, near the Del Mar beach and Oceanside Pier. This district serves ranks E4-E9. All homes include attached garages with openers, washer/dryer hookups, dishwashers, refrigerators, stoves and private patios. Each unit is equipped with ceiling fans and window blinds. Ammenities include two pools, over 30 playgrounds and recreation areas, basketball courts, racquetball, softball and soccer fields and courts. In addition shopping, duty stations and other attractions are nearby and easily accessible, thanks to the SPRINTER. For your convenience, the Stuart Mesa Child Developement Center and Elementary School are located within the community, making Stuart Mesa the ideal choice for the service member and thier families. ***NOTE: RENT SHOWN IS FOR RANK E4. ACTUAL RENT AMOUNT IS EQUAL TO SPECIFIC BAH FOR RANK.